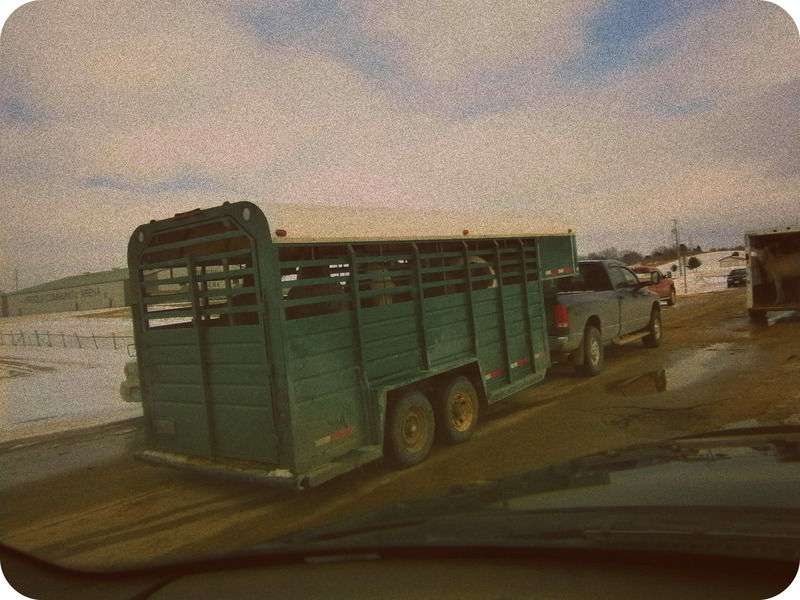 Fliers have been posted, and the word was out that all horse owners could trailer in their horses to the Viroqua Fair Grounds for a horse clinic of sorts. 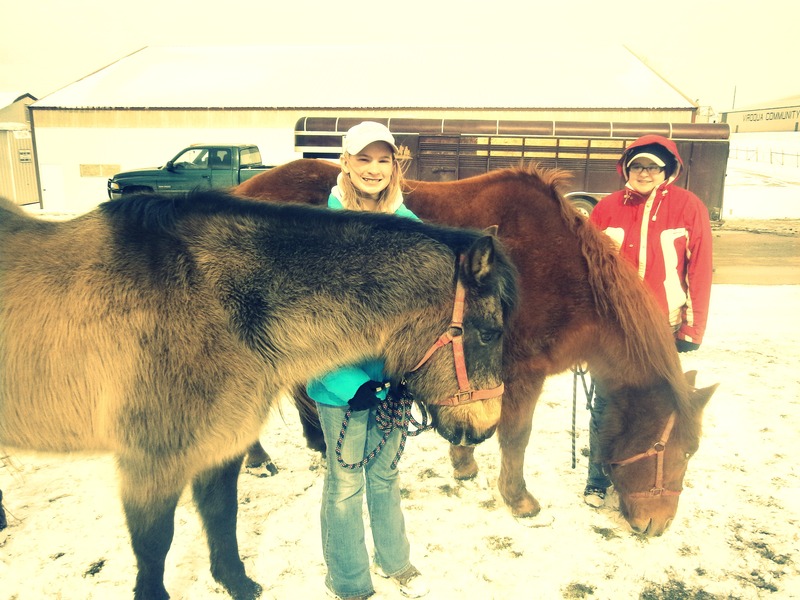 The days event hosted horse professionals on hand to trim hooves, float (‘file’ in non-horse lovers lingo) horses teeth, do equine chiropractic adjustments, and draw blood samples (coggins) for horses in need of clean health records. 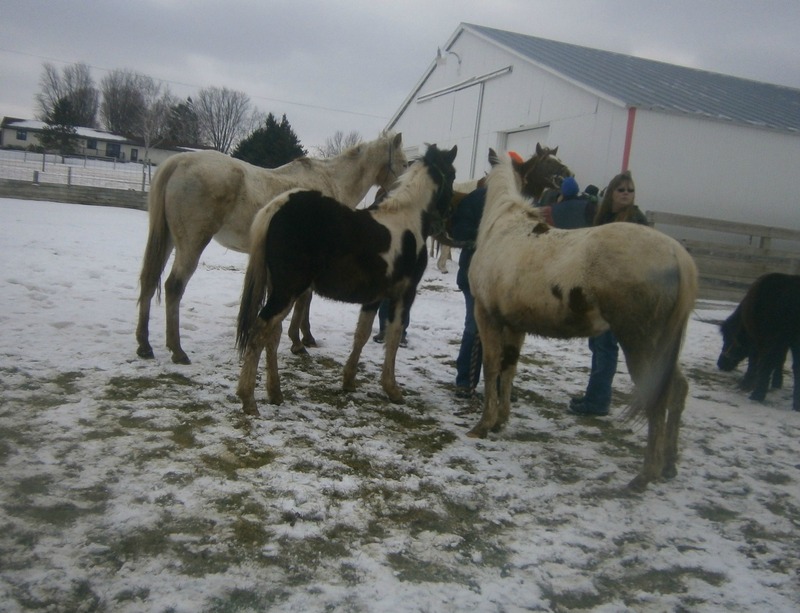 My horse Mars needed his teeth checked and his hooves trimmed, so he was taken to Viroqua with my teenage neighbor girls’ furry 4-legged friends, Cowboy and Cisco. Don’t they look sweet (and freezing)? Adeline also came with the neighborhood clique. She called me at 8 in the morning to ask when I was going to pick her up. Seeing as it will be at least 11 more years before she can get her license, I obliged in picking up my little wrangler before we loaded horses. Adeline has been sick with a nasty cold and unable to go to school for the past 2 days. However, she carefully dressed for the equine occasion and brought a Christmas gift bag with chewable Ibuprofen in it- just like any tough preschool cowgirl would, you know? At the Fair Grounds we found that we were by no means the only ones who had paid attention to the fliers. Publicity for the event had been good and the turnout was also good. What was not good was the weather. March weather here in the Midwest can often have a sharp biting chill with dipping temps. 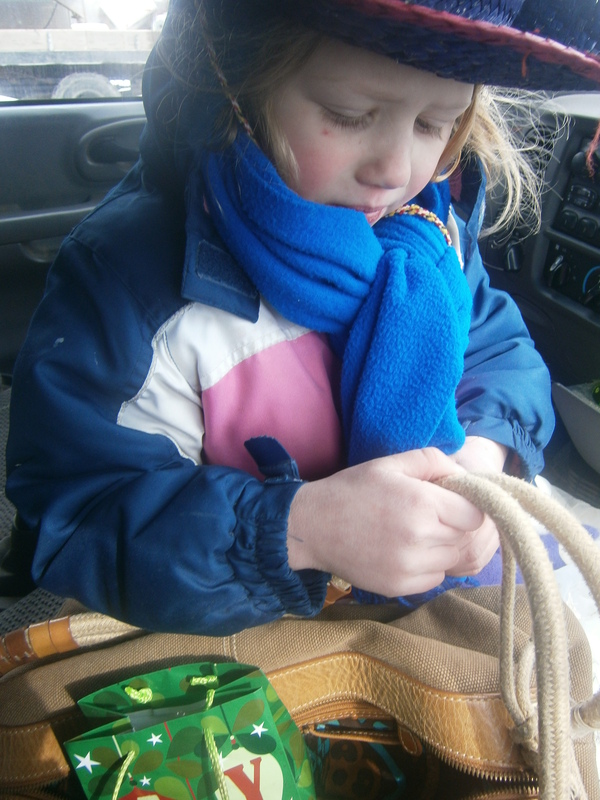 Poor Adeline was coughing away, so I banished her to the truck where she had my purse and her gift bag to entertain her. Beyond the bonus of the warm cab, the view from the truck wasn’t half bad either. 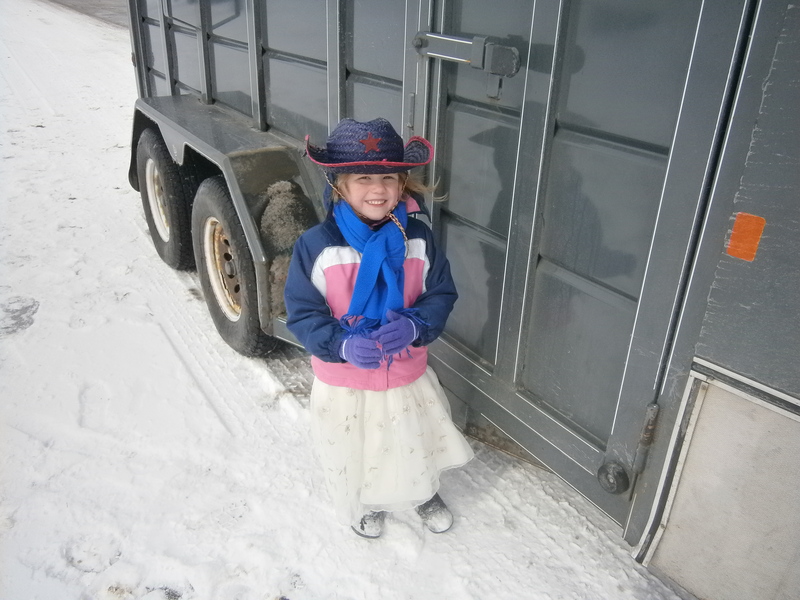 Adeline had a Birdseye view of horses being brought to where a spry and cheerful Amish man was taking on the task of trimming hooves and floating teeth. I was impressed with the Farriers attitude. When it came time to trim my horses hooves things got a little exciting. Mars reared up twice. The second time this happened both the Farrier and his tools went in different directions. After he nimbly got up and collected his nippers, it was recommended that my horse be sedated before getting trimmed. 10 minutes post sedation, Mars had a hanging head and an absent spirit. This made finishing up the job much less difficult. 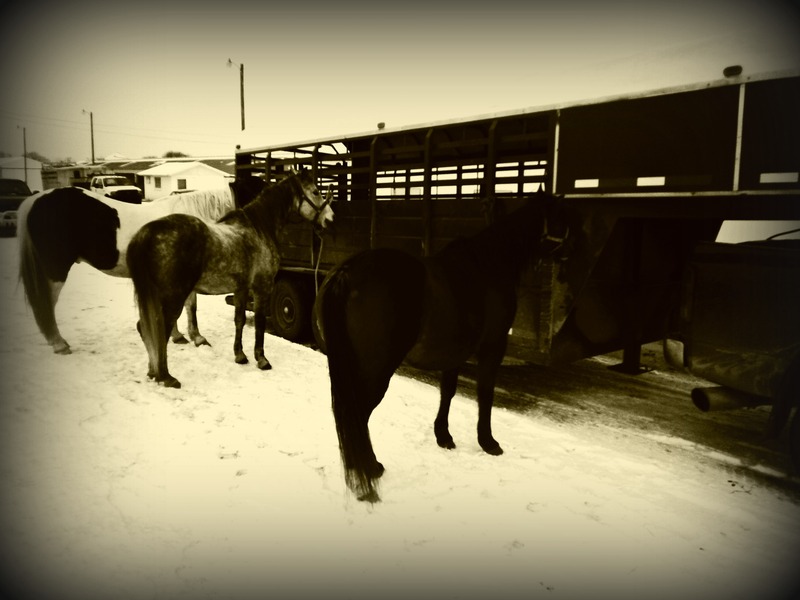 After the neighbors horses were filed and trimmed, everybody got loaded up. With the heater on in the truck we were much more comfortable and eager to leave the Fair Grounds, that is after stopping for butter burgers at Culvers, because this is Wisconsin after all. I am relieved to have my horses feet in better condition and to know his teeth were given a clean bill of health. As for cowgirl Adeline, well all I can say for her is that I hope her ibuprofen and antibiotics are steering her towards a clean bill of health so that she can pester me to give her rides on Devils Hole Red Hot Steeldust, or Mars as I prefer to call him as an alternative to his ridiculous papered name. After all his spirit is back and his feet are in great galloping order. 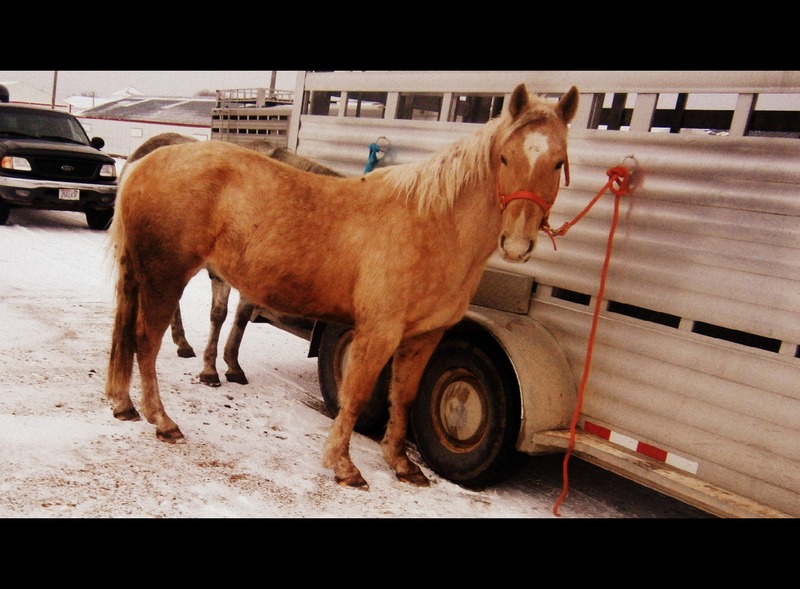 This entry was posted in Mary and tagged coggins, Fair Grounds, Farriers, horses, Neighbors, Photography on March 4, 2012 by sweetridgesisters.